Watch his smile grow faster than you can say “surprise” with one glance at our men’s polished black carbon fiber inlay gift set. 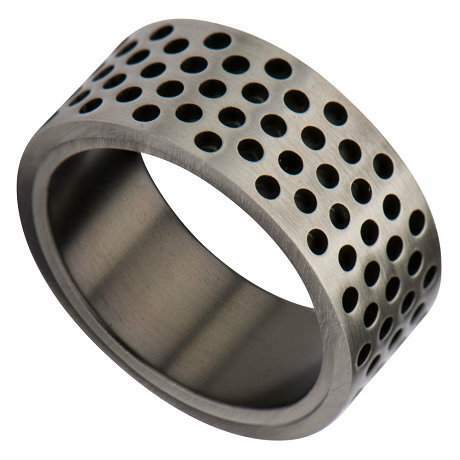 The ring’s center inlay features an electrifying design made of black carbon fiber, which is a geometrically weaved material that many automotive manufacturers use for structural or cosmetic purposes. Few accessories incorporate black carbon fiber inset, but our gift set is packed with fearless fashion. The patterned inlay is accentuated by polished titanium edges with a bright silvery hue. Slick as a shiny new sports car, our men’s black carbon fiber inlay gift set will surely satisfy his need to accessorize. The included 10-inch titanium bracelet offers a lean and mean approach to accessorizing with an edge. Best of all, this cuff bracelet is lightweight and very easy to wear. Finish the look with a ruggedly masculine dog tag pendant. The stylish pendant comes with a 22-inch beaded chain and is constructed from stainless steel for endless quality. Every men’s polished black carbon fiber inlay gift set has the potential to transform his daily ensemble. Just remember – comfort fit rings tend to measure a half size smaller than traditional fittings, so we recommend that your boyfriend, husband, father, or friend have his finger measured to determine whether a comfort fit band is right for him and his lifestyle. 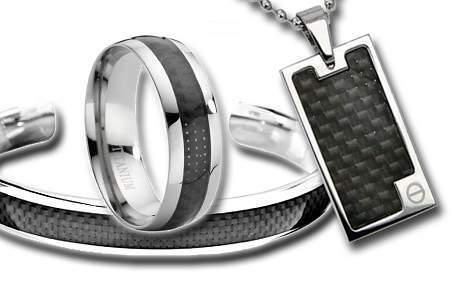 If you have any questions about our men’s black carbon fiber jewelry gift set, please feel free to contact one of our jewelry specialists today. JustMensRings.com strives to provide a shopping experience unlike any other. Discover the difference by exploring our inventory today!